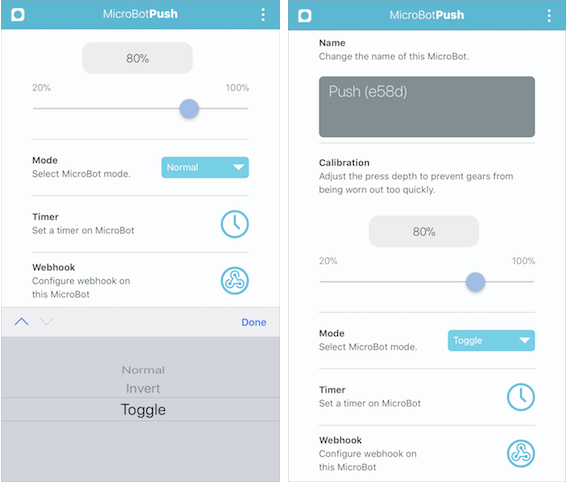 Define your MicroBot Push's mode: normal, toggle or invert. Normal: MicroBot Push's moving tip gets down and then up. Invert: MicroBot Push's moving tip gets up and then down. Toggle: switch from down to up (or inversely) at each trigger. Set MicroBot Push's mode. 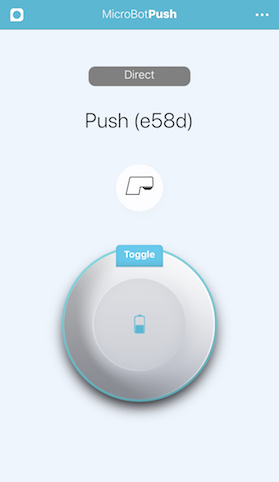 Tap on the 3 dots [...] at the top right corner to access your Push's settings, find 'Mode' in the list of features, and tap on the mode selection bar. Then, select the desired mode (normal, invert, toggle) and tap to save and go back to the homepage. Once set, the mode will appear on your MicroBot Push's UI. Use MicroBot Push on a light switch. Place the Velcro Tape (included with your MicroBot) on your switch and MicroBot Push's tip, install your MicroBot on the switch and make sure both sides of the Velcro tape are stuck with each other. Then, set your MicroBot Push on Toggle mode.